DesignEvo is a free and user-friendly web-based logo design tool that provides a perfect solution for freelancers, small business individuals and entrepreneurs with tight budget that cannot pay for professional logo design services to get a quality logo design. 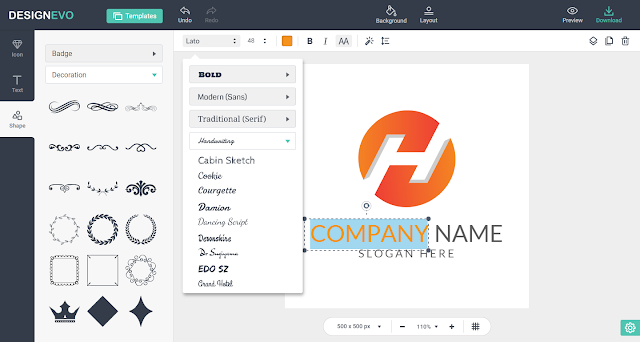 With DesignEvo, anyone can create unique and stunning logos in a few easy steps even without design expertise and skill. DesignEvo comes with a super clean interface and on the homepage, it prepares a 3-minute step-by-step video tutorial, introducing its main features and uses. So a first time user can quickly adapt to it. It also provides massive elaborate preset logo templates that can give you endless ideas. Additionally, all templates are highly customizable and cover a variety of business categories. So you can directly choose one that best fits your business profile, and make some adjustments as you like to quickly complete a logo design. If you’d like to make a unique logo with your own creative ideas, you can also create a new canvas to make a fresh start. DesignEvo has a vast online icon library with millions of options. Type some keywords, then countless related icons are presented in front of you. Besides, it also offers a large collection of stylish fonts and nicely-designed word arts for your selection. With so many resources, you can easily pick your choice and integrate them into stunning visual arts. 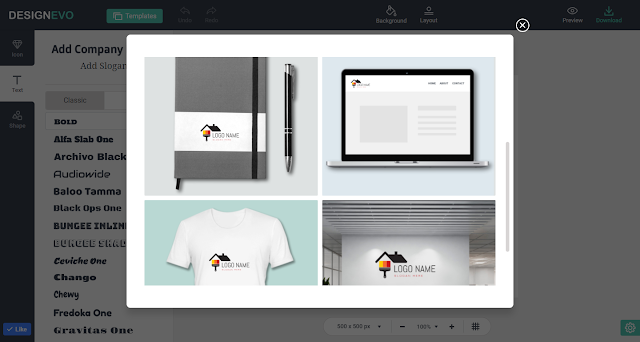 Once you finish the logo, use Preview feature to visualize your final logo used in real life, like printed on T-shirt, business card, letterhead, website and more. Speaking of logo output, it gives you a zip file with three image formats- JPG, PNG and PNG with transparent background. - Easy to use without any registration required. - A range of practical preset logo templates available. - Free access to a vast library of quality icons, fonts and word arts. 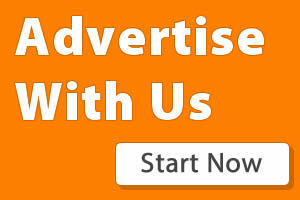 - Logos can be fully customized with powerful editing tools. - Preview created logo in real life scenarios. - Unlimited free logo downloads with high-resolution image formats. DesignEvo offers all features you need to create a logo and makes the cumbersome design process a simple task. Play around with DesignEvo and you’ll be amazed at the fact that a perfect logo design is just one click away. LogoAi.com is a new website that uses Artificial Intelligence to ‘design’ logos.Every day, hundreds of thousands of people visit LogoAi.com. 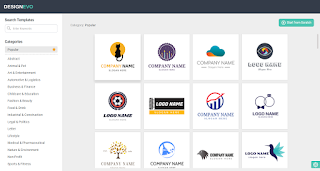 The more LogoAi.com family know about their visitors, the better and more relevant logo designs they can provided for their users! It is very easy to use, anyone can easily make their logo easily!